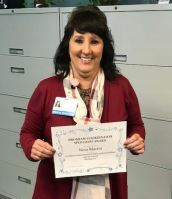 Congratulations to Program Coordinator Nora Martin, Radiation Oncology, who was chosen to be the PC Spotlight Award recipient for Fourth Quarter 2018. Nora was recognized for “consistently exceeding expectations and improving the administration of the Graduate Medical Education program.” Thanks Nora – great work! The Graduate Medical Education office recognizes program coordinators who strive to do their best, have excellent communication skills, work to improve their residency or fellowship program, and are overall shining stars.